Powder for solution for injection or infusion. A white to light yellow powder. Severe pneumonia, including hospital and ventilator-associated pneumonia. Merokem (Meropenem) may be used in the treatment of patients with bacteraemia that occurs in association with, or is suspected to be associated with, any of the infections listed above. The tables below provide general recommendations for dosing. The dose of Merokem (Meropenem) administered and the duration of treatment should take into account the type of infection to be treated, including its severity, and the clinical response. A dose of up to 2 g three times daily in adults and adolescents and a dose of up to 40 mg/kg three times daily in children may be particularly appropriate when treating some types of infections, such as infections due to less susceptible bacterial species (e.g. Enterobacteriaceae, Pseudomonas aeruginosa, Acinetobacter spp. ), or very severe infections. Additional considerations for dosing are needed when treating patients with renal insufficiency (see further below). Merokem (Meropenem) is usually given by intravenous infusion over approximately 15 to 30 minutes (see sections 6.2, 6.3 and 6.6). Alternatively, doses up to 1 g can be given as an intravenous bolus injection over approximately 5 minutes. There are limited safety data available to support the administration of a 2 g dose in adults as an intravenous bolus injection. The dose for adults and adolescents should be adjusted when creatinine clearance is less than 51 ml/min, as shown below. There are limited data to support the administration of these dose adjustments for a unit dose of 2 g.
Merokem (Meropenem) is cleared by haemodialysis and haemofiltration. The required dose should be administered after completion of the haemodialysis cycle. There are no established dose recommendations for patients receiving peritoneal dialysis. No dose adjustment is necessary in patients with hepatic impairment (see section 4.4). No dose adjustment is required for the elderly with normal renal function or creatinine clearance values above 50 ml/min. The safety and efficacy of Merokem (Meropenem) in children under 3 months of age have not been established and the optimal dose regimen has not been identified. However, limited pharmacokinetic data suggest that 20 mg/kg every 8 hours may be an appropriate regimen (see section 5.2). The adult dose should be administered. There is no experience in children with renal impairment. Merokem (Meropenem) is usually given by intravenous infusion over approximately 15 to 30 minutes (see sections 6.2, 6.3, and 6.6). Alternatively, Merokem (Meropenem) doses of up to 20 mg/kg may be given as an intravenous bolus over approximately 5 minutes. There are limited safety data available to support the administration of a 40 mg/kg dose in children as an intravenous bolus injection. Hypersensitivity to any other carbapenem antibacterial agent. Severe hypersensitivity (e.g. anaphylactic reaction, severe skin reaction) to any other type of betalactam antibacterial agent (e.g. penicillins or cephalosporins). The selection of Merokem (Meropenem) to treat an individual patient should take into account the appropriateness of using a carbapenem antibacterial agent based on factors such as severity of the infection, the prevalence of resistance to other suitable antibacterial agents and the risk of selecting for carbapenem-resistant bacteria. Resistance to penems of Enterobacteriaceae, Pseudomonas aeruginosa, and Acinetobacter spp. varies across the European Union. Prescribers are advised to take into account the local prevalence of resistance in these bacteria to penems. As with all beta-lactam antibiotics, serious and occasionally fatal hypersensitivity reactions have been reported (see sections 4.3 and 4.8). Patients who have a history of hypersensitivity to carbapenems, penicillins or other beta-lactam antibiotics may also be hypersensitive to Merokem (Meropenem). Before initiating therapy with Merokem (Meropenem), careful inquiry should be made concerning previous hypersensitivity reactions to beta-lactam antibiotics. If a severe allergic reaction occurs, the medicinal product should be discontinued and appropriate measures taken. Antibiotic-associated colitis and pseudomembranous colitis have been reported with nearly all anti-bacterial agents, including Merokem (Meropenem), and may range in severity from mild to life threatening. Therefore, it is important to consider this diagnosis in patients who present with diarrhoea during or subsequent to the administration of Merokem (Meropenem) (see section 4.8). Discontinuation of therapy with Merokem (Meropenem) and the administration of specific treatment for Clostridium difficile should be considered. Medicinal products that inhibit peristalsis should not be given. Seizures have infrequently been reported during treatment with carbapenems, including Merokem (Meropenem) (see section 4.8). Hepatic function should be closely monitored during treatment with Merokem (Meropenem) due to the risk of hepatic toxicity (hepatic dysfunction with cholestasis and cytolysis) (see section 4.8). Use in patients with liver disease: patients with pre-existing liver disorders should have liver function monitored during treatment with Merokem (Meropenem). There is no dose adjustment necessary (see section 4.2). A positive direct or indirect Coombs test may develop during treatment with Merokem (Meropenem). The concomitant use of Merokem (Meropenem) and valproic acid/sodium valproate/valpromide is not recommended (see section 4.5). This medicinal product contains approximately 4.0 mEq of sodium per 1.0 g dose which should be taken into consideration by patients on a controlled sodium diet. No specific medicinal product interaction studies other than probenecid were conducted. Probenecid competes with Merokem (Meropenem) for active tubular secretion and thus inhibits the renal excretion of Merokem (Meropenem) with the effect of increasing the elimination half-life and plasma concentration of Merokem (Meropenem). Caution is required if probenecid is co-administered with Merokem (Meropenem). The potential effect of Merokem (Meropenem) on the protein binding of other medicinal products or metabolism has not been studied. However, the protein binding is so low that no interactions with other compounds would be expected on the basis of this mechanism. Decreases in blood levels of valproic acid have been reported when it is co-administered with carbapenem agents resulting in a 60-100 % decrease in valproic acid levels in about two days. Due to the rapid onset and the extent of the decrease, co-administration of valproic acid/sodium valproate/valpromide with carbapenem agents is not considered to be manageable and therefore should be avoided (see section 4.4). Simultaneous administration of antibiotics with warfarin may augment its anti-coagulant effects. There have been many reports of increases in the anti-coagulant effects of orally administered anti-coagulant agents, including warfarin in patients who are concomitantly receiving antibacterial agents. The risk may vary with the underlying infection, age and general status of the patient so that the contribution of the antibiotic to the increase in INR (international normalised ratio) is difficult to assess. It is recommended that the INR should be monitored frequently during and shortly after co-administration of antibiotics with an oral anti-coagulant agent. There are no or limited amount of data from the use of Merokem (Meropenem) in pregnant women. As a precautionary measure, it is preferable to avoid the use of Merokem (Meropenem) during pregnancy. Small amounts of Merokem (Meropenem) have been reported to be excreted in human milk. Merokem (Meropenem) should not be used in breast-feeding women unless the potential benefit for the mother justifies the potential risk to the baby. No studies on the effect on the ability to drive and use machines have been performed. However, when driving or operating machines, it should be taken into account that headache, paraesthesia and convulsions have been reported for Merokem (Meropenem). In a review of 4,872 patients with 5,026 Merokem (Meropenem) treatment exposures, Merokem (Meropenem)-related adverse reactions most frequently reported were diarrhoea (2.3 %), rash (1.4 %), nausea/vomiting (1.4 %) and injection site inflammation (1.1 %). The most commonly reported Merokem (Meropenem)-related laboratory adverse events were thrombocytosis (1.6 %) and increased hepatic enzymes (1.5-4.3 %). In the table below all adverse reactions are listed by system organ class and frequency: very common (≥ 1/10); common (≥ 1/100 to <1/10); uncommon (≥ 1/1,000 to <1/100); rare (≥ 1/10,000 to <1/1,000); very rare (< 1/10,000). Within each frequency grouping, undesirable effects are presented in order of decreasing seriousness. Hepatobiliary disorders Common transaminases increased, blood alkaline phosphatase increased, blood lactate dehydrogenase increased. Uncommon urticaria, toxic epidermal necrolysis, Stevens Johnson syndrome, erythema multiforme. Merokem (Meropenem) is licensed for children over 3 months of age. There is no evidence of an increased risk of any adverse drug reaction in children based on the limited available data. All reports received were consistent with events observed in the adult population. Relative overdose may be possible in patients with renal impairment if the dose is not adjusted as described in section 4.2. Limited post-marketing experience indicates that if adverse reactions occur following overdose, they are consistent with the adverse reaction profile described in section 4.8, are generally mild in severity and resolve on withdrawal or dose reduction. Symptomatic treatments should be considered. In individuals with normal renal function, rapid renal elimination will occur. Haemodialysis will remove Merokem (Meropenem) and its metabolite. Merokem (Meropenem) exerts its bactericidal activity by inhibiting bacterial cell wall synthesis in Gram-positive and Gram-negative bacteria through binding to penicillin-binding proteins (PBPs). Similar to other beta-lactam antibacterial agents, the time that Merokem (Meropenem) concentrations exceed the MIC (T>MIC) has been shown to best correlate with efficacy. In preclinical models Merokem (Meropenem) demonstrated activity when plasma concentrations exceeded the MIC of the infecting organisms for approximately 40 % of the dosing interval. This target has not been established clinically. Bacterial resistance to Merokem (Meropenem) may result from: (1) decreased permeability of the outer membrane of Gram-negative bacteria (due to diminished production of porins) (2) reduced affinity of the target PBPs (3) increased expression of efflux pump components, and (4) production of beta-lactamases that can hydrolyse carbapenems. Localised clusters of infections due to carbapenem-resistant bacteria have been reported in the European Union. There is no target-based cross-resistance between Merokem (Meropenem) and agents of the quinolone, aminoglycoside, macrolide and tetracycline classes. However, bacteria may exhibit resistance to more than one class of antibacterials agents when the mechanism involved include impermeability and/or an efflux pump(s). European Committee on Antimicrobial Susceptibility Testing (EUCAST) clinical breakpoints for MIC testing are presented below. 1 Merokem (Meropenem) breakpoints for Streptococcus pneumoniae and Haemophilus influenzae in meningitis are 0.25 mg/l (Susceptible) and 1 mg/l (Resistant). 2 Isolates with MIC values above the susceptible breakpoint are very rare or not yet reported. The identification and antimicrobial susceptibility tests on any such isolate must be repeated and if the result is confirmed the isolate sent to a reference laboratory. Until there is evidence regarding clinical response for confirmed isolates with MIC values above the current resistant breakpoint they should be reported resistant. 3 Susceptibility of staphylococci to carbapenems is inferred from the cefoxitin susceptibility. 4 Breakpoints relate to meningitis only. 5 Non-species related breakpoints have been determined using PK/PD data and are independent of MIC distributions of specific species. They are for use only for organisms that do not have specific breakpoints. Non species related breakpoints are based on the following dosages: EUCAST breakpoints apply to Merokem (Meropenem) 1000 mg x 3 daily administered intravenously over 30 minutes as the lowest dose. 2 g x 3 daily was taken into consideration for severe infections and in setting the I/R breakpoint. 6 The beta-lactam susceptibility of streptococcus groups A, B, C and G is inferred from the penicillin susceptibility. — = Susceptibility testing not recommended as the species is a poor target for therapy with the drug. Isolates may be reported as R without prior testing. The prevalence of acquired resistance may vary geographically and with time for selected species and local information on resistance is desirable, particularly when treating severe infections. As necessary, expert advice should be sought when the local prevalence of resistance is such that the utility of the agent in at least some types of infections is questionable. The following table of pathogens listed is derived from clinical experience and therapeutic guidelines. † Resistance rate ≥ 50% in one or more EU countries. Glanders and melioidosis: Use of Merokem (Meropenem) in humans is based on in vitro B.mallei and B. pseudomallei susceptibility data and on limited human data. Treating physicians should refer to national and/or international consensus documents regarding the treatment of glanders and melioidosis. In healthy subjects the mean plasma half-life is approximately 1 hour; the mean volume of distribution is approximately 0.25 l/kg (11-27 l) and the mean clearance is 287 ml/min at 250 mg falling to 205 ml/min at 2 g.
Doses of 500, 1000 and 2000 mg doses infused over 30 minutes give mean Cmax values of approximately 23, 49 and 115 μg/ml respectively, corresponding AUC values were 39.3, 62.3 and 153 μg.h/ml. After infusion over 5 minutes Cmax values are 52 and 112 μg/ml after 500 and 1000 mg doses respectively. When multiple doses are administered 8-hourly to subjects with normal renal function, accumulation of Merokem (Meropenem) does not occur. A study of 12 patients administered Merokem (Meropenem) 1000 mg 8 hourly post-surgically for intra-abdominal infections showed a comparable Cmax and half-life to normal subjects but a greater volume of distribution 27 l.
The average plasma protein binding of Merokem (Meropenem) was approximately 2 % and was independent of concentration. After rapid administration (5 minutes or less) the pharmacokinetics are biexponential but this is much less evident after 30 minutes infusion. Merokem (Meropenem) has been shown to penetrate well into several body fluids and tissues: including lung, bronchial secretions, bile, cerebrospinal fluid, gynaecological tissues, skin, fascia, muscle, and peritoneal exudates. Merokem (Meropenem) is metabolised by hydrolysis of the beta-lactam ring generating a microbiologically inactive metabolite. In vitro Merokem (Meropenem) shows reduced susceptibility to hydrolysis by human dehydropeptidase-I (DHP-I) compared to imipenem and there is no requirement to co-administer a DHP-I inhibitor. Merokem (Meropenem) is primarily excreted unchanged by the kidneys; approximately 70 % (50 –75 %) of the dose is excreted unchanged within 12 hours. A further 28% is recovered as the microbiologically inactive metabolite. Faecal elimination represents only approximately 2% of the dose. The measured renal clearance and the effect of probenecid show that Merokem (Meropenem) undergoes both filtration and tubular secretion. Renal impairment results in higher plasma AUC and longer half-life for Merokem (Meropenem). There were AUC increases of 2.4 fold in patients with moderate impairment (CrCL 33-74 ml/min), 5 fold in severe impairment (CrCL 4-23 ml/min) and 10 fold in haemodialysis patients (CrCL <2 ml/min) when compared to healthy subjects (CrCL >80 ml/min). The AUC of the microbiologically inactive ring opened metabolite was also considerably increased in patients with renal impairment. Dose adjustment is recommended for patients with moderate and severe renal impairment (see section 4.2). Merokem (Meropenem) is cleared by haemodialysis with clearance during haemodialysis being approximately 4 times higher than in anuric patients. A study in patients with alcoholic cirrhosis shows no effect of liver disease on the pharmacokinetics of Merokem (Meropenem) after repeated doses. Pharmacokinetic studies performed in patients have not shown significant pharmacokinetic differences versus healthy subjects with equivalent renal function. A population model developed from data in 79 patients with intra-abdominal infection or pneumonia, showed a dependence of the central volume on weight and the clearance on creatinine clearance and age. The pharmacokinetics in infants and children with infection at doses of 10, 20 and 40 mg/kg showed Cmax values approximating to those in adults following 500, 1000 and 2000 mg doses, respectively. Comparison showed consistent pharmacokinetics between the doses and half-lives similar to those observed in adults in all but the youngest subjects (<6 months t1/2 1.6 hours). The mean Merokem (Meropenem) clearance values were 5.8 ml/min/kg (6-12 years), 6.2 ml/min/kg (2-5 years), 5.3 ml/min/kg (6-23 months) and 4.3 ml/min/kg (2-5 months). Approximately 60 % of the dose is excreted in urine over 12 hours as Merokem (Meropenem) with a further 12 % as metabolite. Merokem (Meropenem) concentrations in the CSF of children with meningitis are approximately 20 % of concurrent plasma levels although there is significant inter-individual variability. The pharmacokinetics of Merokem (Meropenem) in neonates requiring anti-infective treatment showed greater clearance in neonates with higher chronological or gestational age with an overall average half-life of 2.9 hours. Monte Carlo simulation based on a population PK model showed that a dose regimen of 20 mg/kg 8 hourly achieved 60 %T>MIC for P. aeruginosa in 95 % of pre-term and 91 % of full term neonates. Pharmacokinetic studies in healthy elderly subjects (65-80 years) have shown a reduction in plasma clearance, which correlated with age-associated reduction in creatinine clearance, and a smaller reduction in non-renal clearance. No dose adjustment is required in elderly patients, except in cases of moderate to severe renal impairment (see section 4.2). Animal studies indicate that Merokem (Meropenem) is well tolerated by the kidney. Histological evidence of renal tubular damage was seen in mice and dogs only at doses of 2000 mg/kg and above after a single administration and above and in monkeys at 500 mg/kg in a 7-day study. Merokem (Meropenem) is generally well tolerated by the central nervous system. Effects were seen in acute toxicity studies in rodent at doses exceeding 1000 mg/kg. The IV LD50 of Merokem (Meropenem) in rodents is greater than 2000 mg/kg. In repeat dose studies of up to 6 months duration only minor effects were seen including a decrease in red cell parameters in dogs. There was no evidence of mutagenic potential in a conventional test battery and no evidence of reproductive toxicity including teratogenic potential in studies in rats up to 750 mg/kg and in monkeys up to 360 mg/kg. There was no evidence of increased sensitivity to Merokem (Meropenem) in juveniles compared to adult animals. The intravenous formulation was well tolerated in animal studies. The sole metabolite of Merokem (Meropenem) had a similar profile of toxicity in animal studies. A solution for bolus injection is prepared by dissolving the drug product in water for injection to a final concentration of 50 mg/ml. Chemical and physical in-use stability for a prepared solution for bolus injection has been demonstrated for 3hours at up to 25°C or 12 hours under refrigerated conditions (2-8°C). From a microbiological point of view, unless the method of opening/reconstitution/dilution precludes the risk of microbiological contamination, the product should be used immediately. If not used immediately in-use storage times and conditions are the responsibility of the user. A solution for infusion is prepared by dissolving the drug product in either 0.9% sodium chloride solution for infusion or 5% dextrose solution for infusion to a final concentration of 1 to 20 mg/ml. Chemical and physical in-use stability for a prepared solution for infusion using 0.9% sodium chloride solution has been demonstrated for 3 hours at up to 25°C or 24 hours under refrigerated conditions (2-8°C). From a microbiological point of view, unless the method of opening/reconstitution/dilution precludes the risk of microbiological contamination, the product should be used immediately. If not used immediately in-use storage times and conditions are the responsibility of the user. Reconstituted solution of the product in 5%dextrose solution should be used immediately. The reconstituted solutions should not be frozen. Type III glass vial with grey, bromobutyl rubber stopper sealed with a grey aluminium flip-off cap. 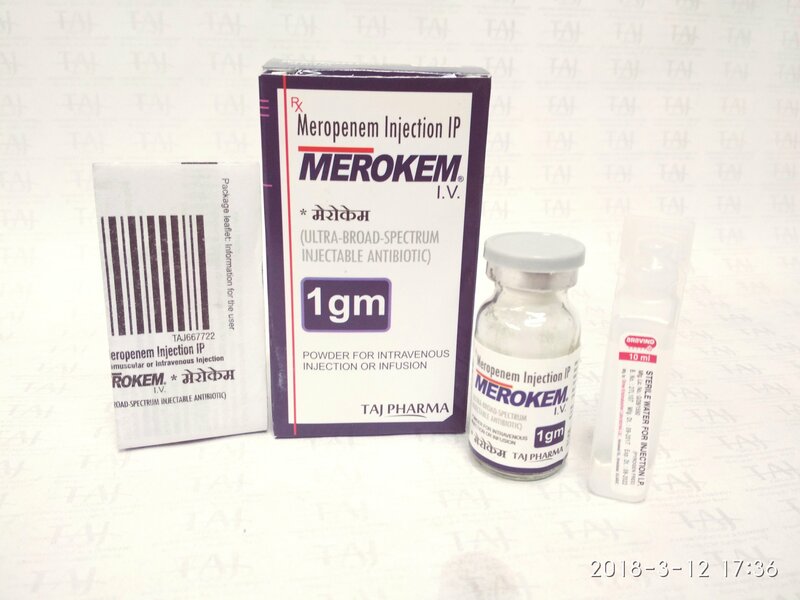 Merokem (Meropenem) to be used for bolus intravenous injection should be reconstituted with sterile water for injection. For intravenous infusion, Merokem (Meropenem) vials may be directly reconstituted with 0.9 % sodium chloride or 5% glucose solutions for infusion. Each vial is for single use only. Standard aseptic techniques should be used for solution preparation and administration. The solution should be shaken before use.